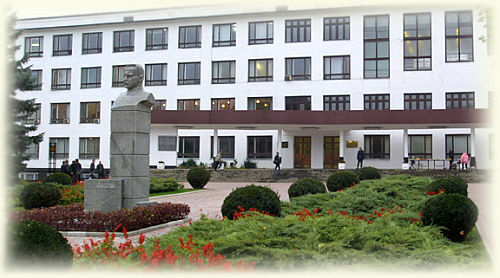 Ternopil National Economic University is a multidisciplinary educational complex consisting of fourteen Faculties (Faculty of Finance, Faculty of Banking Business, Faculty of Agricultural Economics and Management, Faculty of International Business and Management, Faculty of Economics and Management, Faculty of Accounting and Audit, Faculty of Computer and Information Technologies, Ukrainian-Dutch Faculty of Economics and Management, Ukrainian-German Economic Faculty, Law Faculty, Faculty of Pre-University, Postgraduate and Masters Training, Novovolynsk Faculty, Sambir Faculty of Applied Software and Kalush Faculty), and three institutes that train specialists in nine areas and twenty-two specialties, sixty-eight Departments, and Education and Consulting Centers. The total number of students studying at the University is 24 thousand. The TNEU academic staff includes 1134 employees, 46 of them are Doctors of Sciences, 484 are Candidates of Sciences, Docents, 4 Honored Workers of Public Education of Ukraine, 4 Honored Scientists of Ukraine, 1 Honored Jurist of Ukraine, 5 Merited Educators; 38 lecturers are the full members of the Academy of Sciences, 17 are the corresponding members of the branch-wise academies of sciences, 3 Honored Inventors of Ukraine, 2 Honored Worker of Education of Ukraine, 1 Honored Master of Sports of Ukraine, 2 Honored Coaches of Ukraine, 1 Honored Workers of Culture of Ukraine, 12 Masters of Sports of Ukraine. Two-thirds of the University Departments are headed by Doctors of Sciences. Nine Scientific Schools are functioning within the University. The academic staff annually publishes more than 2000 scientific works, including above fifty monographs and course books. The University offers Doctoral studies in four specialties, and Postgraduate studies in sixteen specialties; there are three specialized Academic Boards for Defense of PhD Theses, and two specialized Academic Boards for Defense of Doctoral Theses. Great efforts of our teaching staff are dedicated to their practical work. With that purpose the Consulting Centers affiliated to certain Departments were established. Since 2001 the TNEU, in cooperation with other eight higher educational establishments of Ukraine, has been taking part in implementation of the program for Public Authority Staff Retraining, working in business area, called “Ukrayins’ka Initsiatyva” (Ukrainian Initiative). During this period the University has trained many specialists for eight Western oblasts (regions); the majority of them completed traineeships in the EU countries, some of them started their own businesses. In addition, the graduates of “Ukrayins’ka Initsiatyva” Programme have to execute a Consulting Project before completion of their studies. The Projects are innovational, since they include problems of business plans design for both existing and future companies. The University introduced a licensed MBA program that aims at upgrading business managers in the following innovation areas: management of business value with the aim of its maximization, management of organizational changes in an unstable business environment, management of marketing innovations. The Program acts as a transitional stage before the introduction of exclusive business education in Ukraine that previously used to be offered only by foreign business schools. The TNEU is one of the three Ukrainian universities, which are implementing the Programme. The TNEU is the only Ukrainian higher educational establishment situated outside the capital that has its branch abroad, in Yerevan (the capital of Armenia). More than 500 young people of Ukrainian origin study there. The Branch was established six years ago and it is already successful and competitive at the Caucasian market of educational services among the universities of the US, France and Russia. The TNEU also has its Branches in Vinnytsya, Ivano-Frankivsk, Lutsk, Kalush (Ivano-Frankivsk region), Kamyanets-Podilskyy (Khmelnytsk region), Novovolynsk (Volyn region), Sambir (Lviv region), Svalyava (Transcarpathian region), Chortkiv (Ternopil region), Foros (Crimea). The Community Center, the Museum of the University’s History and the Region’s Economy, R&D Center of History of Money, Center of Physical Culture, “Ekonomichna Dumka” Publishing House, Electronic Resource Library are the TNEU’s important structural subdivisions. The TNEU students have access to the Electronic Libraries of the UK and Aarhus Business School (Denmark). The sanatorium-dispensary, accommodating 50 people is available for employees and students. They are also offered therapeutic, dental, physiotherapeutic, massage, and fitness services; the rooms for emotional stress relief, medical treatment, reflexotherapy, thermotherapy, hydrotherapy, as well as canteens, cafes and buffets are also available. Within the University the “Universytets’ka Dumka” (University Thought) paper is published; students take active part in the University’s Amateur Groups, Vocal Ensemble, Bandura Ensemble, Dance Group, Student Dramatic Performance Group, Elocution Club, and KVK (The Rah-rah and Quick-witted Club) team. Four Amateur Groups were conferred the status of “People’s Amateur Talent Group”. Having entered the European educational area, we are proudly sharing the achievements of the TNEU’s professors and students with the world community. Scientific researches, numerous works of economic researchers are the important issues for bringing up a new generation of national science that will be competitive in the context of globalization. The University’s close cooperation with forty-eight leading educational establishments of the USA, Germany, Poland, Bulgaria, France, the Netherlands, Denmark, Greece, China, Slovakia, Spain, and Mexico indicates great potential in skill formation, and international recognition of the TNEU’s research and pedagogic activity. The University’s professors and lecturers in cooperation with their foreign partners were the first in Ukraine to make scientific researches dealing with the problems of Ukraine’s integration into the European Economic Community. The membership of the University’s scientists in the European Association for International Education (Amsterdam, the Netherlands) is an important factor for international recognition of our educational institution. Great Britain, Poland, Bulgaria, France, the USA, Canada, China and Greece are the TNEU’s partners in the European Association for International Education. The University participates in joint European projects, cooperating with the Frankfurt-am-Main University (Germany), Rotterdam University (the Netherlands), Lyon University (France), University of Rome “La Sapienza” (Italy), McGill University (Canada), and other higher educational establishments. In 2005, the TNEU became the member of the European University Association, and on the 19th of September 2008, it joined the Magna Charta Universitatum. The TNEU is one of the first higher educational establishments in Ukraine to participate in the experimental implementation of the basic principles of the Bologna Declaration into the educational process. The University has adopted the credit and module system of educational process organization; the informational packages of the Faculties and the specialties are placed on the web-site; the individual and work curricula are systematized and implemented in accordance with the Bologna Process. While adopting the best experience of economic education, the University enters the European market of educational services with confidence. The University has won a number of international grants that enabled additional funding of the University’s development, and facilitated specialists quality training. 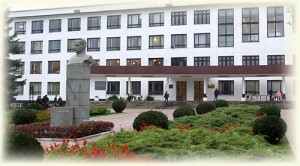 The scientists of this higher educational establishment are engaged in fifteen international research program; more than one hundred foreign students study at the TNEU’s Faculties; more then one hundred TNEU’s students annually take part in short-term study programs at foreign universities; lecturers and students are constantly participating in conferences, workshops, and seminars hold overseas. Professors from foreign universities – the participants of the TNEU research-to-practice conferences – conduct classes with students, and grade examinations. The University has top rank positions as a result of evaluation of 2007-08 performed by international and Ukrainian experts. In particular, in 2007, the University was among the five best Economic Universities of Ukraine, and in 2008, it took the eleventh position among the higher educational establishments of the 3rd-4th levels of accreditation. The University is one of the leading educational institutions of Ukraine. The University’s graduates are the vivid example of self-actualization, freethinking, national identity, and creativity in research. They are active participants of public and political movements, and democratic processes in Ukraine.